When I finally finish Terminal Cafe (probably while at work sometime this week--I'm heading into a five-day/60-hour slog starting tomorrow), I think my next two selections will b e a couple of well-known classics that I have somehow never managed to catch over the years. ifferent alternate universe, that didn't have this book and these movies, without realizing it. 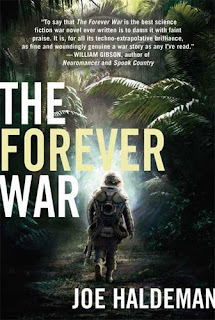 The other one, newly re-released by St. Martin's and newly bought by me at Barnes and Noble with some of my tax refund money, is Joe Haldeman's The Forever War. This one I had certainly heard of again and again over the years, but never managed to turn up a copy in either a store or a library. Or just wasn't remembering to look for it when there probably were copies around. I remember first hearing of it when I was a kid in the early 80s and had read in either Analog or Asimov's a review of a game based on it. Later, I kept hearing of it as being a sort of counterpoint or rebuttal to Starship Troopers. Anyway, I am looking forward to it, because I have had a sort of secondary project going on the last couple years of trying to read the major works of military science fiction. The novel that I have been ever more slowly writing (code-name Current Project...should soon be re-named Neglected Project) has developed into something that could probably be classified as military sf, so that's a lot of the reason I have lately become more interested in that sub-genre. This new edition features an intro by John Scalzi. Don't feel bad- I've never heard of The Power either. What's it supposed to be about? I don't know much about it yet, and have been avoided reading reviews of it so as not to get a lot of "spoilers," but apparently it deals with some sort of mutant, super-human species that has existed among us for a long time and is making its move to take over. In style, the novel is supposed to be a suspense thriller. Robinson, the author, whom I had sort of heard but never really read anything by, is a not-very-prolific but well-regarded writer. 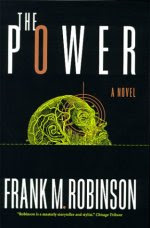 I believe The Power was his first novel and was originally published back in the 1950s. I think that the edition that I have might be an updated version of it where Robinson went back over it during the 1990s and changed some things to make the setting of it more contemporary. I'm not sure how I feel about that: some other writers have done updates like that. Card, for example, updated Ender's Game a while back to change how he portrays the Russians because he wanted to include in his timeline the end of the Soviet Union, which hadn't happened yet when he first published the book. I don't know. Stories are products of their times and I don't know if they necessarily suffer for having references and settings that are out of synch with real-world events. I think I agree with you there. It's sci-fi, after all; you can always just say it's an alternate universe. I guess you better lend this one to me when you've finished it. I'll trade you for Neil Stephensen's Anathem. You'll have that read before I finish the last 100 pages of Blue Mars. Jeeezus. Before that, Pat, you still have PURPLE Mars....just kidding.